(SAM) We woke up late the next day and washed the dishes from the feast the night before. We left the gates of the camp at 7:30. (PAUL) Before leaving camp, the semi-granola Argentinean was up and about drinking coffee and wiping the sleep from her eyes. I got a good look at her and, while she is not Salma Hayek, I upgraded her out of granola status to simply: Adventurous nature girl. We got out into the park at about 7:30am. The sun had already popped his head above the horizon, but the quiet of the morning, the scarcity of other cars/safarians, and the building expectations of seeing more game (esp. the elusive Big 5) added another beautiful morning to a great trip. The morning drive was fairly uneventful: springbok, impala, and elephants. Then we saw a lone rhino in the distance. While we saw rhinos in the park at night, this was our first sighting in daylight. He (or she) was awesome. His main horn could do some serious damage. We joked about him charging our car and how cool it would be if his horn punctured the car door and missed me by a hair. The plan was to steadily make our way out of the park on the eastern portion through the Namitoni gate. It was about 12:30 pm. Then, lo and behold, our big break. 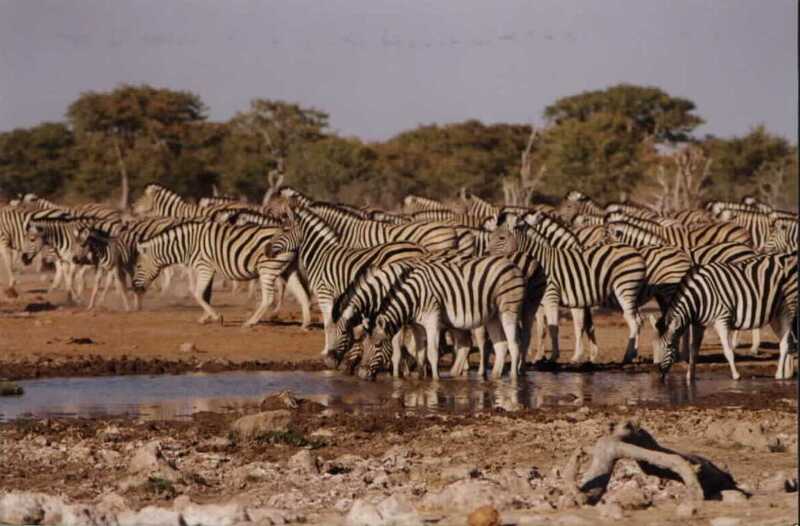 About 2 km from the Namatoni gate/camp, we were driving past a watering hole when we saw 4-6 cars. That many cars usually means big game! When we drove up, we asked: What’s the big deal? Then Chris saw 2 female lions basking under a tree without a care in the world. Excitement. Wonder. Awe. These 2 lions were close enough for us to see their faces. They were simply resting, sleeping, casually looking about, even getting playful. They were such beautiful animals. They have an air of understated power, grace, and danger. We continued our watch with close attention. A car was leaving and the driver held up 3 fingers to indicate 3 lions. We then moved our car to a better vantage point. 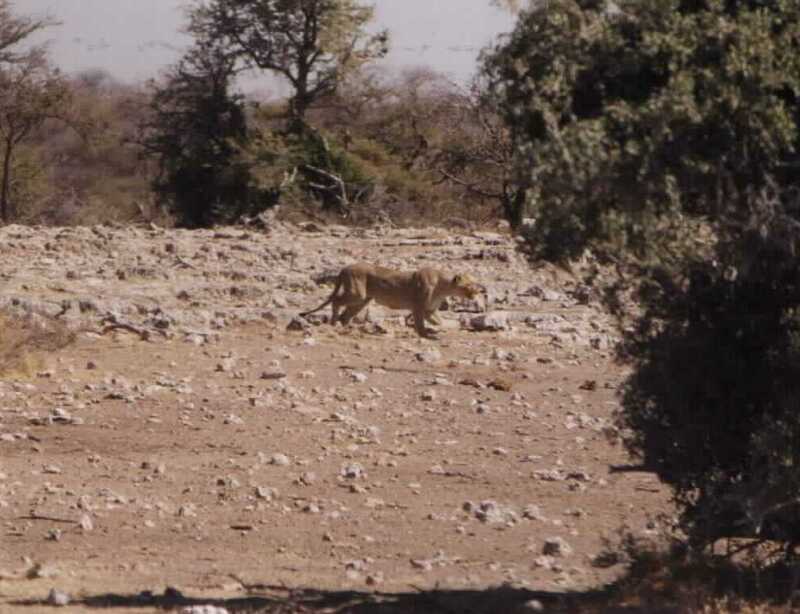 From there we could see the ultimate: a third lion, unknown to us previously, hidden by a bush. He was low to the ground with his eyes fixed on an unsuspecting potential victim: the sweet, lovable (but delicious) springbok. We couldn’t believe our eyes. Right before us was this springbok near the watering hole. He was looking about as if he sensed something was wrong. His springbok friends were nowhere near. There were animals on the other side of the water, but none was stupid enough to test their manhood against the baddest cat in the world. Giraffes were there. Gemsbok also. Springbok a plenty. However, most, if not all kept a safe distance away from the lion. They even all looked directly in the direction of the hungry lion. But for some reason, the springbok didn’t get the message. Then the lion made a great move: in a flash, he snuck closer to the springbok by hiding next to a bush. The scene was set. A kill right out of Mutual of Omaha’s Wild Kingdom. The circle of life and death. Strength and weakness. Power and grace. Vulture heaven. The springbok looks, panics, and flees. Gone. Escaped to live another day. For some reason, the lion who was relaxing behind the stalking lion casually approached his buddy. This movement blew the stalker’s cover and the springbok easily was tipped off. We were so disappointed. A kill is so rare (but not as rare as fresh springbok meat.) So for the next 3 hours we waited in the same spot, watching the 3 lions sleep, play, sleep, look around. There were possible kills: giraffe and other springbok. But the lions were too comfortable. Taking down a giraffe would be too much work for these guys. We waited and waited. We outlasted the other cars. We ate peanut butter sandwiches and used the nearby trees as bathrooms. We got restless and a little bored. The lions were simply not going to satisfy our bloodlust. At about 4:30pm (and after having failed to convince Sam to go out to the pond to wash his hands) we left the lions behind for the Naumtoni gate. WE got to Tsumkwe, the last town before the park at 10:30. WE found no gas stations but found a camping area (no workers awake) at the local lodge. We talked for a few minutes with some fellow campers (Afrikaans Namibians) and fell asleep in our pop-up tent.